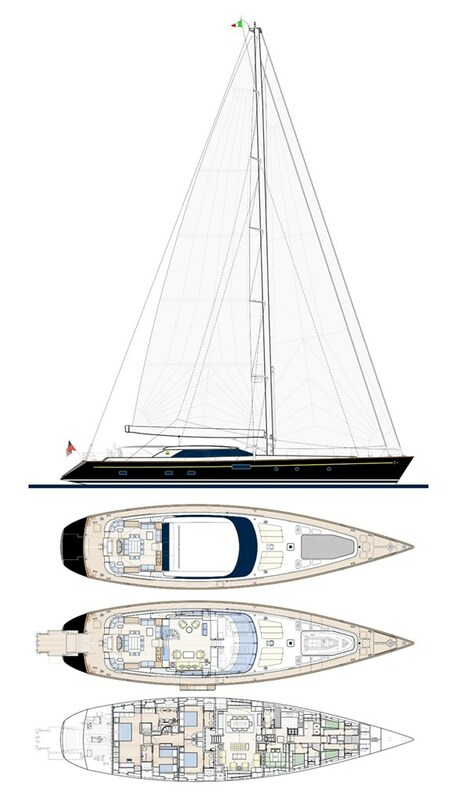 Custom tailored for a Turkish client who upgraded his smaller brokerage Perini Navi for a new build. Full carbon rig and rigging controlled from the hallmark hemi-spherical Perini helm pod married sailing performance with themes from the owner’s previous Perini. S/Y State of Grace is exceptionally spacious for its length, with stylish contemporary Perini Navi interiors and has served as a very successful charter platform. Of the four staterooms, the owner’s features an ensuite gym. Exceptional thought was put into the arrangement of her impeccably finished interiors. A split level salon area with unmatched space and light is perfectly fused with a warm and tasteful décor. State of Grace’s full beam master suite complete with a large Turkish Hammam steam shower, also features a professional ‘Therasage’ massage & shiatsu machine and a fully equipped gym with Technogym cross trainer, rowing machine, free weights and exercise bars. Her spacious covered cockpit area has ample seating and adjustable tables, making it a versatile space for entertaining or relaxing. A large selection of fun and active water toys including wakeboards & towables is available. She also boasts a fishing chair with full deep sea equipment for the fishing enthusiasts.